Successfully Added Ilife A8 Robotic Vacuum Cleaner Anti-Collision Remote Control Home Robot Sweeper with Camera Navigation Black (EU Standard) to your Shopping Cart. 2600mAH Li-ion battery with fade-free technology brings 160 minutes working time after one full charge, also ensures a lasting battery life. It has 12mm climbing function 15 degrees climbing height. ILIFE A8 works on various floor types: Carpet, Ceramic Tile, Marble Floor, Tile Floor, Wood Floor. 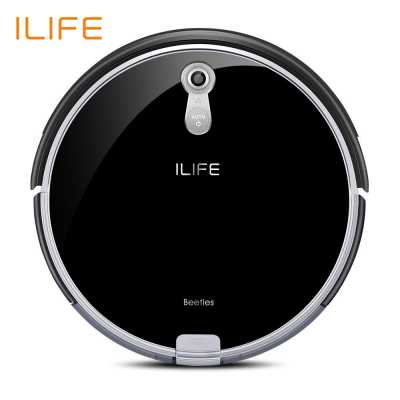 ILIFE A8 Intelligent Robotic Vacuum Cleaner is an essential household cleaning machine. The groundbreaking panoview navigation enables A8 to clean methodically, deeply and thoroughly in less time. the gen 3 cyclonepower system enhanced to delivery thorough clean for your home. The BladeAway spiral Rubber Brush combining with our Tangle Free Technology extracts dirt efficiently and solves the toughest issue caused by tangled brush that most robot vacuums faced. A full suite of Intelligent Sensors beneath the robot allow ILIFE robot cleaner to work its way around furniture and avoid stairs or other dangerous drop-offs. the intelligent i-voice technology tells you what A8 is doing or if it requires attention. The 160min working time with 2600mAh powerful Li-ion battery is specially designed for the large home. the extra-large roadrover wheels stabilize A8 as it moves across different surfaces and avoids obstacles. Start your new day without heavy housework and clean your floor every day all at a push of the button! Automatic Cleaning for home and office, large area available up to 150-200 square meters. Even when you open the max mode, the noise will not surpass 65db, it’s easy to help you solve the noise problem. The intelligent i-voice technology tells you what A8 is doing or if it requires attention. You can control the robot cleaner easily not more than 4m. The tempered glass top cover makes it more durable and better feel, the high-gloss jet black finish presents you so purely and indeed black.